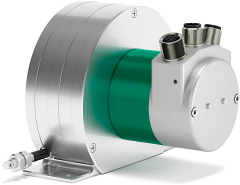 Lika Electronic stands for encoders and position measuring systems. Since its inception in 1982, Lika Electronic develops and manufactures incremental and absolute, optical and magnetic, rotary and linear encoders, incremental & absolute sensors, linear and rotary incremental & absolute magnetic measurement systems, rotary actuators, displays, signal converters and encoder interfaces. Lika Electronic is certified for compliance with ISO 9001:2000 quality management system and is now committed to adopt an environmental management system complying with ISO 14001:2004 requirements. All Lika's products are designed and manufactured to fully meet the requirements of CE, RoHS and REACH directives, most of them are UL and CSA compliant too. ATEX certified solutions suitable to be integrated into potential explosive environments and hazardous areas are also available. Lika Electronic operates all over the world providing a widespread and efficient global distribution network, offering unrivalled technical support and excellent customer service. At the present time the export share is approximately 60% of the turnover in more than 50 countries.